Designed for music lovers who don't sacrifice sound for style, urBeats deliver pure audio in an ultra-lightweight and durable package. A solid metallic housing, matched with the newest gold, silver and space gray edition colors, will be your phone's perfect match. The tangle-free cable with built-in-mic will help you effortlessly switch between music and calls so that you can enjoy premium, uninterrupted sound. Break through the limitations of wired listening. Unplug your Solo2 Wireless, pair with your Bluetooth device and move freely for up to 30 feet of wireless listening. Take hands-free calls with the built in mic, and use the on-ear controls to adjust your listening experience without reaching for your device. Stay unplugged all day thanks to the 12-hour rechargeable battery. The illuminated LED fuel gauge on the headphone lets you know when it's time to recharge. Immerse yourself in an emotional sound experience. The Solo2 Wireless has a dynamic and wide range of sound with a natural clarity. The ear cup padding buffers outside noise, bringing you closer to what the artist intended you to hear. Regardless of what kind of music youre into, you will feel the crisp, balanced sound in your Solo2 Wireless. The Solo2 Wireless headphone's durable housing and compact, foldable design make it the ultimate on-the-go accessory. Whether you're on the subway, dancing in your living room, or at your desk, you won't have to worry about getting tangled up in cords. Plus, if you run out of power, plug in for unlimited wired listening. This premium headphone is ready for your life, wherever it may go. 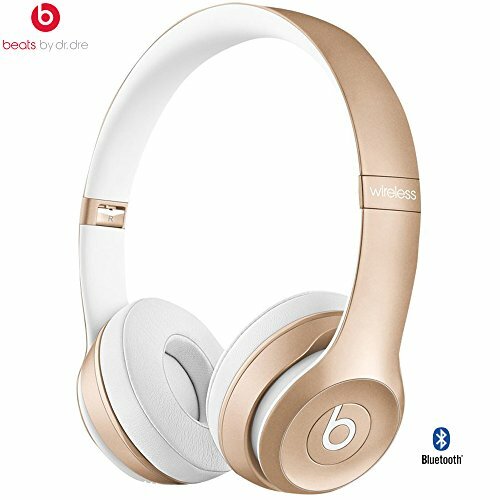 These Beats Solo 2 headphones are a wonderful choice for anyone who likes to listen to music on the go. The newly redesigned headphones now feature updated and improved acoustics, so you can feel your music at a wider range of sound and with a crisp.